Senate President Kevin Raye, R-Perry, confers with leaders of the Senate after a bill to overhaul Maine's health insurance laws was passed in the Senate, at the State House, in Augusta on Monday, May 16, 2011. AUGUSTA, Maine — The state Senate gave final approval Monday to a health care reform bill that aims to spark more competition in Maine’s insurance market but that critics contend could drive up costs, particularly in rural areas of the state. With a 24-10 vote, the Senate ended weeks of debate on what has emerged as the most partisan issue, to date, of the 2011 legislative session. Gov. Paul LePage, a Republican, is expected to sign the legislation into law Tuesday. The Senate action came three days after Republican leaders pushed to complete work on the bill, LD 1333. The bill’s fast track infuriated Democrats and threatened to cast a partisan cloud over efforts to craft a new, $6.1 billion budget. Ultimately, Republican leaders postponed a final vote until Monday but it was obvious that tensions were still higher than usual, despite the cooling-down period. “I believe from start to finish this has been a bad process,” said Sen. Joseph Brannigan, D-Portland, a member of the Insurance and Financial Services Committee where the partisan fighting began. The bill has numerous provisions aimed at opening up Maine’s insurance market. Beginning in 2014, Mainers who are purchasing individual insurance rather than through an employer could shop around for policies in the other New England states with the exception of Vermont. The bill also would allow smaller businesses to pool together when purchasing insurance in order to get lower rates. The bill would not allow insurance companies to deny coverage based on pre-existing conditions. But the measure seeks to insulate insurance companies by creating a “high-risk pool” to cover Mainers who use more health services. That reinsurance program would be paid for with a $4-per-month fee added to almost every policyholder in the state — everyone except state employees and legislators, a point made repeatedly by Democrats during Monday’s debate. Republican leaders said they plan to close that exemption. “The current system is not working. We do need to make some changes,” said Sen. Bill Diamond, D-Windham, one of the three Democrats who supported the bill. But critics have said the measure could dramatically drive up insurance costs for older Mainers and those living in more rural areas by giving insurance companies more discretion to base premiums on a person’s age, occupation and place of residence. 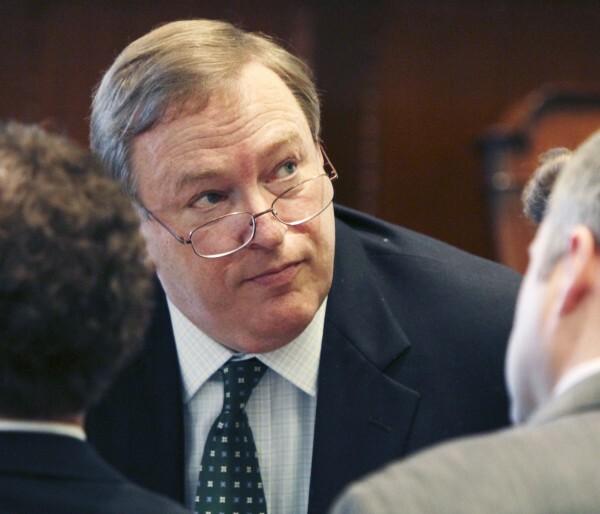 Sen. Phil Bartlett, D-Gorham, accused the GOP leadership of rushing the bill without adequate time to examine the potential impacts, particularly on residents in rural areas. Echoing comments made throughout the debate over LD 1333, Bartlett suggested that the legislation was largely written by or for the insurance industry. Republicans picked up three Democrats in the Senate after amending the bill to address lawmakers’ concerns about rising rates in rural areas and insurance companies forcing policyholders to travel long distances for care. Sen. Nancy Sullivan, D-Biddeford, said her decision to sign onto the bill made her feel a bit like “a skunk at the family picnic.” But Sullivan said that state must do something to address sky-high insurance rates that are too costly for many Mainers to afford. Likewise, Sen. Elizabeth Schneider, D-Old Town, acknowledged that she was taking a risk by supporting the bill, aspects of which still cause her “grave concern.” Schneider said, however, she chose to work to make the bill better. “I am also hopeful that if we do not achieve our goal and lower the costs for all of the people of Maine that we will be back to fix it,” Schneider said. But Bartlett said that despite supporters’ talk of the need to help the 130,000-plus uninsured people in Maine today, there is nothing in the bill that would guarantee coverage for anyone. And if you are over age 45, Bartlett said, your rates may increase because of the bill. Democrats have been accusing GOP leaders of attempting to ramrod the bill through the Legislature ever since the bill was passed out of committee on a partisan vote after minimal debate. Opponents also have accused Republicans of refusing to give the Maine Bureau of Insurance time to perform actuarial studies on the measure. On Monday, just as Senate debate began, it was announced that bureau director Mila Kofman will step down as of June 1. The fracas over health care also threatened to trickle down into lawmakers’ attempts to build bipartisan consensus on the $6.1 billion budget. Last week, Rep. Patrick Flood, R-Winthrop, the House chairman of the powerful Appropriations Committee, handed in his resignation amid the partisan sniping over the health insurance bill. On Monday, however, he announced he would stay at the post. Addressing the bill’s relatively quick trip through Legislature, GOP leaders said that many of the bill’s proposals have been used elsewhere with success. They said there was no reason to wait, especially with the Legislature facing a wave of other issues — including the budget — that must be dealt with during the next month.